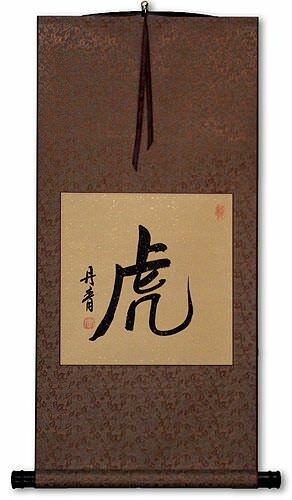 Buy Dedication Chinese Calligraphy Wall Scrolls! 専唸 is the Japanese word for dedication. It means "give undivided attention" or "devote oneself to (something)." This Chinese, Japanese, and Korean word holds the dictionary definition of "determination" but literally means, "determined heart." The first character means "to determine" or "determined." The second character means "heart," "mind" or "soul," so you can imagine that this form of "determination" partially means to put your heart into something. It can also be translated as resolve, resolution, or decision (as in a decision made and followed). 信念 express the idea of "having a belief," or "trusting in the unseen." 信念 could also be translated as beliefs or convictions. Note: Also considered to be one of the Seven Heavenly Virtues. 獻身 is used to describe being so devoted to something that you will make sacrifices for that goal/thing/person. This can be a dedication to or for someone but more often is used in reference to a dedication or making sacrifices for your country, public service, or a cause. For instance, an Olympic athlete makes great sacrifices to train in his/her sport for their country and compatriots. While the form shown to the upper-left is considered an ancient Japanese version, in modern Japan, they use the simplified version of the first Kanji (shown to the right). Click on the Kanji at the right instead of the button above if you want this modern Japanese version. If you are looking for a more religious meaning of devotion, see Faith. When you take this word apart, you find the sum is a little different than the parts. The first character means blood and the second means heart. It is important to note that for thousands of years, it was believed that your heart was both your soul and your mind in Asian culture. When you add blood to the heart, it is your whole being - it is pure and clean dedication with your whole soul. Most Chinese dictionaries define this as sincerity of heart or a MEDICAL TERM!!! Please think carefully before ordering this selection - it was only added as others have used this for coffee cups and other novelties (though perhaps naively).